Russia | Hey, you know what? 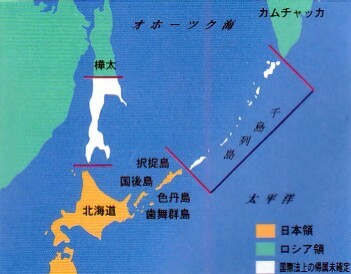 Territorial dispute between Japan and Russia. The Cairo Declaration and the Potsdam Declaration did not apply to the Northern Territories because those islands had never belonged to Russia even before 1904-1905. Russia had not previously claimed the disputed islands, not in all the time since it began diplomatic relations with Japan in 1855. Therefore the disputed islands could not be considered part of the territories acquired by Japan "by violence and greed". The Yalta Agreement "did not determine the final settlement of the territorial problem, as it was no more than a statement by the then leaders of the Allied Powers as to principles of the postwar settlement. (Territorial issues should be settled by a peace treaty.) Furthermore, Japan is not bound by this document, to which it did not agree." 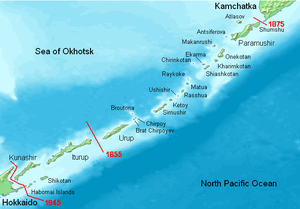 Russia's 1945 entry into the war against Japan was a violation of the Soviet–Japanese Neutrality Pact, and the occupation of the islands was therefore a violation of international law. The Soviet Union repudiated the neutrality pact on April 5, 1945, but the pact remained in effect until April 13, 1946.